Do you want to go corded or cordless? All you need to get a corded electric cultivator going is a household power outlet and an extension cord. Using a corded cultivator is as simple as performing a quick maintenance check, plugging it in, and pushing it along your garden rows. You won't be able to break ground for planting a new garden, but you will be able to aerate and weed your garden as long as you're able to stand. A handy feature of corded cultivators is theirs adjustable tilling width. With several inches of variation, you can quickly and easily take on different-sized jobs with one convenient tool. If you plan on spending more than 45 minutes at a time working on the quality of your garden soil, a corded model is the right choice for you. Cordless cultivators were designed to be easy-to-use tools that allow gardeners to work without being tethered to a power source. All you need to do is charge a battery and throw it into the cultivator, and you can take on gardening tasks for about 45 minutes. For the best performance, look for a model that uses a lithium-ion battery. These maintain consistent power throughout the entire charge. Cultivating your garden is smart, but why settle for just mixing your soil when there's so much more an electric cultivator can do? To take advantage of all your electric cultivator's potential, make sure that the machine you choose can be paired with multiple attachments and accessories. 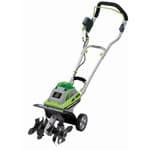 Both corded and cordless cultivators are lightweight, energy-conscious pieces of garden equipment that can turn your soil from brittle to beautiful. For more advice on choosing the right electric cultivator, take a look at our list of the best electric cultivators to see popular, expert-recommended products! 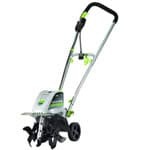 Electric Cultivator Buyer's Guide - Find Out How to Pick the Perfect Electric Cultivator. Our rototiller how-to library can help you pick the perfect electric cultivator, gas cultivator, front tine rototiller, rear tine garden tiller or garden tiller accessory.